Exploring the wilderness is one of the most fulfilling activities one can do. Being close to nature, getting back to basics and connecting to the environment is what being outdoors is all about. That being said, the environment can be unforgiving, depending on where you’re camping and what time of year. Heat exhaustion is a very real risk when camping, especially in the hot summer months. Here, we’ll talk about heat exhaustion while camping, and some of the steps you can take to mitigate the risks. It’s recommended to plan ahead before you head out. Check the weather reports if possible and know the area and your limits. 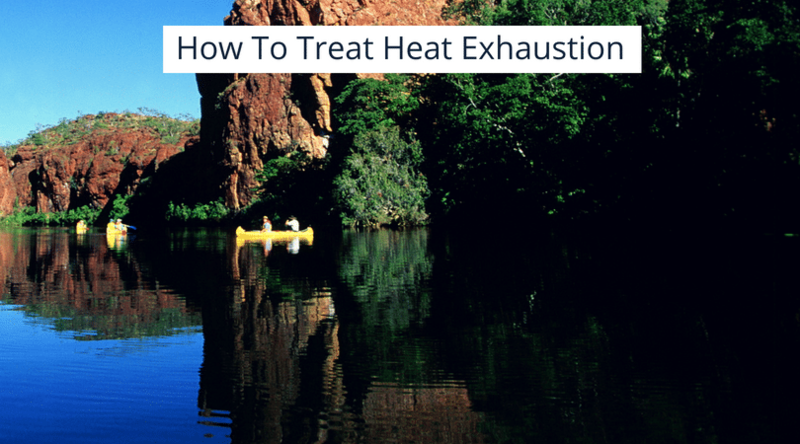 One of the most important steps to treating heat exhaustion is prevention. Don’t over exert yourself, conserve energy and keep hydrated. Our bodies are normally very good at regulating temperature. Naturally, our body will try and regulate itself. Internal organs work their best when we are at about 98.6F degrees (37C). We lose heat by exhaling, sweating, and transferring heat from blood vessels to skin by dilation. When our temperature rises faster then we can cool, we have a problem. It can’t be stressed enough that keeping hydrated is important! When we sweat, we lose water. When out in the wild, it’s important to be proactive with your water consumption. Being thirsty is actually a sign that you are already dehydrated. Test your lips! If they are cracked and dry, you could be dehydrated. Pay close attention to the color of your urine. When relieving yourself, take note of the color; it should be clear-ish, or diluted yellow. Having a darker yellow or even orange color is an indication that you are dehydrated. Sports drinks can be helpful for staying hydrated. Try to avoid alcohol and caffeine, as these are classified as diuretics and make you urinate more frequently. Prevention is one of the best ways to minimize your chances of heat stroke. It’s important to dress appropriately. Wear loose fitting, and light colored clothing. Keep a bottle of sunscreen close by and reapply throughout the day. Not only can sunburned skin lead to problems, such as pain, damage, irritation or even skin cancer; but damaged skin is not as efficient managing heat. It can be harder for your body to cool itself, and sweat if it is heavily sunburned or damaged. If it’s particularly hot or humid, it may be best to pass the time in a cool or shaded area whenever you can, waiting for the sun to pass, and for cooler temperatures. Use the morning hours or evening daylight for hiking and traveling. Try to rest and stay hydrated during the midday heat and sun. Planning ahead and scheduling yourself can help prevent heat exhaustion. Sometimes, it’s best to wait out the heat and take it easy. If you are experiencing heat exhaustion, here are some basic steps you can take to remedy the situation. It’s important to not exacerbate the situation. So move to a shaded spot, under a tree, or behind a rock or hill. Lay down, or lay the person, down. Elevate the legs and feet slightly. This will help pool blood into the torso. Heavy and tight clothing can restrict blood flow and reduce the body’s ability to cool itself. Wet the skin or soak clothes in water. If you are treating someone, spray and moisten the skin. Consume water in small amounts frequently. (avoid alcohol and caffeine drinks) add a pinch of salt or sugar if available to about a quart (liter) of water to help balance electrolytes. It’s OK if the water is vomited up. Some of the water will be absorbed. Heat exhaustion can lead to heat stroke which can cause permanent damage or lead to death. Plan ahead, stay hydrated, and don’t over exert yourself. The wilderness has its dangers, but with a cool-head and the right plan, it can be safely enjoyed.